Training to hike the Pacific Crest Trail (PCT) last year, I walked up and around Twin Peaks in San Francisco. Blue trail signs dotted my route. I was immediately intrigued as I had never heard of the Bay Area Ridge Trail. 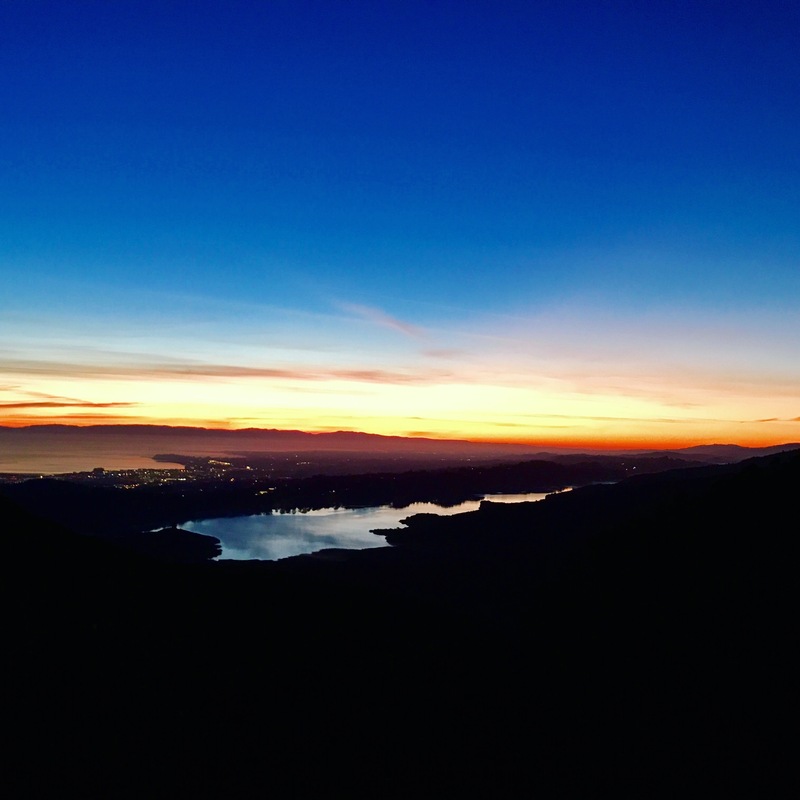 I knew then, that after returning from the PCT, I wanted to explore the Bay Area Ridge Trail. Upon getting back, I realized doing a thru-hike of the Bay Area Ridge Trail was out of the question for two reasons. One, extensive fire damage in Northern California and need for trail work and two, big gaps of incomplete trail made logistics impossible. Instead, I sought the longest section and managed to link 70 miles of nearly continuous trail. Since, I didn’t have time off work, my goal became completing this 70-mile hike in two days. I began my hike climbing a hill from Sneath Lane in the unique darkness of the lunar eclipse. I hiked quickly, hoping to get to the top of the ridge to catch the re-emergence of the moon. My breath clouded the cold air and I could begin to see some other early morning risers who decided to enjoy the lunar eclipse from the trail. As I reached the ridge, I caught my breath and the moon slowly escaped earth’s shadow. Sometimes, I sing when I hike, but today I hiked in silence enjoying the beginning of the morning warming the land. I alternated between admiring the Pacific Ocean and the sunrise. A loud rustling stopped my reverie and I looked further down the trail and out of the bush came a creature playfully bounding towards me. What was it? It looked like a puppy, but as it approached I could clearly see it was a young fox. The fox looked up at me in surprise and we both jumped. It, seemingly realizing for the first time that I was there, quickly switched directions and continued its bouncy run. I just stood there. I had hiked from Mexico to Canada and hadn’t seen a single fox. Yet, only a half an hour from San Francisco, I met this cheerful creature. The success of this wildlife corridor began to sink in as I continued my walk. The trail wandered the ridge passing by old military ruins, open vistas of the sea, through trees and brush and eventually lead me to paved streets. Trying to stay off roads, I adjusted my route a bit to pass through a couple extra green spaces. 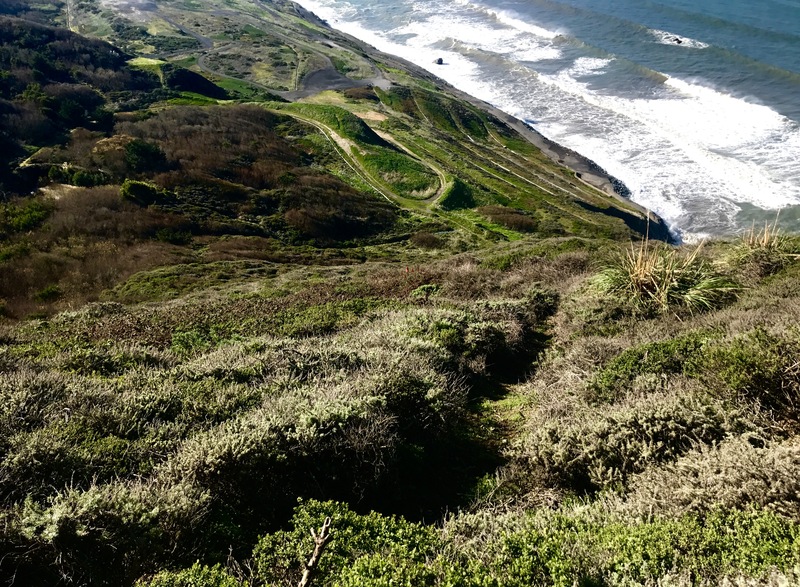 I headed through the Mussel Rock Open Space, which is comprised of areas overlooking the ocean and cliffs that drop down to the beach. Eventually, I reached a dead-end where excessive erosion and landslides, stole the trails from the hillside in front of me. I backtracked. There was one small trail leading up the side of a hill that upon looking at my maps it seemed like a feasible route to a road. I assessed for a while and then began the steep upward climb. At the top, I discovered a row of houses blocked the road. I was trapped. I nervously scanned the houses and walked until I saw a break in the line and managed to get back out to the street. Happy to be back en route, I couldn’t help but be disappointed that the Mussel Rock Open Space Alternate Route was not successful. I continued on the sidewalk wondering what people thought I was doing hiking in Daly City, which felt a lot like suburbia. I reached another alternate I had planned and cut over to the ocean a little south of Fort Funston. Trails led me through dunes covered in colorful, though invasive, ice plant. Walking in sand was a constant struggle of slipping a little bit backwards for every step forwards. I thought these little losses of forward process wouldn’t be noticeable, but it managed to tire me more than I expected. Exhausted from the sand, I almost welcomed the transition back to the sidewalk following the edge of Lake Merced. Heading right into San Francisco, the Bay Area Ridge Trail sticks mostly to green spaces. Since the trail strives to accommodate bikes, slight adjustments to the route can allow you to pick more pleasant walking paths through the parks. Reaching the end of Stern grove, my hunger started to nag me and I started to daydream about food as I commonly do on long hikes. “If I run into a Starbucks, I will buy cake pops,” I either thought or said aloud to myself. And sure enough a few corners later I was eating cake pops and taking advantage of a flush toilet. 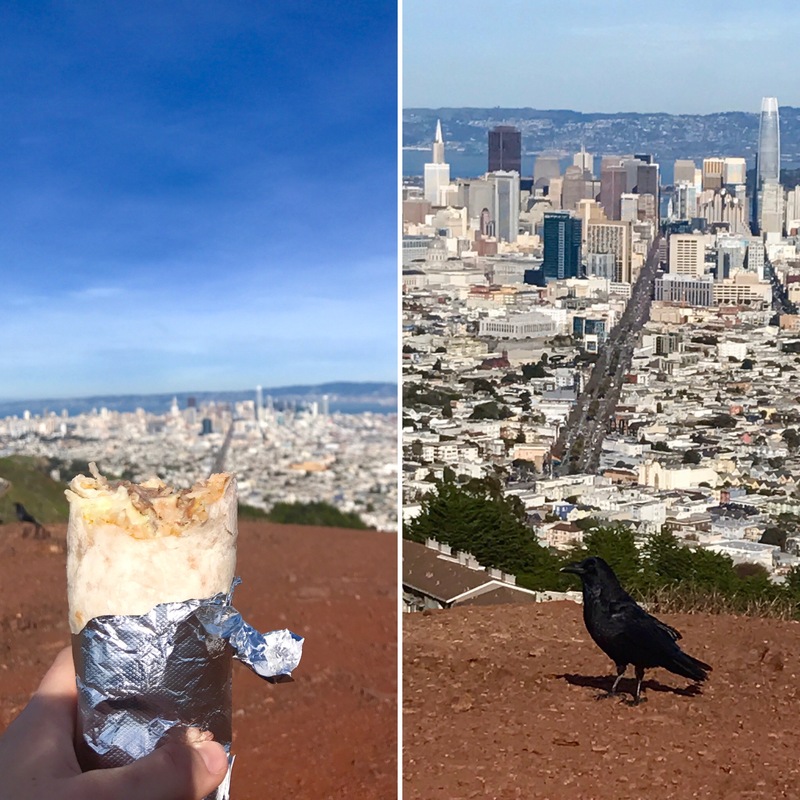 Only a mile later, I decided it was time for lunch and hiked a freshly made burrito to the top of Twin Peaks. It was some of the best trail food I have ever had. I sat alone on one of the peaks and crows started to gather thinking I would give them a nibble. I laughed at them as I demolished my entire burrito, being sure to pick up the two grains of rice that I lost. I admired the birds as they periodically got brave enough to inch closer. There black feathers glistened in the sun, and they tilted their heads to see me better. Each of them ready to make a move if a competition broke out over a food scrap. I apologized to the birds, and informed them that I was pretty good about Leave No Trace. I left from my seat on the rock as some tourists came panting to the top of the hill. At this point I was on the way to my campsite. My “campsite” tonight was a friend’s house just North of Golden Gate Park. It was a luxurious end of the day with Chinese take out, a warm shower and a bed all to myself. Urban hiking definitely has some real perks. The following morning I got a ride, to San Rafael and began hiking south on the trail back towards the city. I started in the dark, hiking over rolling hills. In the distance, I could start to make out some large lumps. At first I thought they were rocks, but I quickly realized they were cows. I walked noisily banging my trekking poles so as not to startle them. They shook themselves as if they had just woken up and looked at me with confusion. As sun stained the sky, the cows seemed much more alert. The day quickly became hot and as I left the pasture lands entering a more vegetated section. I was greeted with a quick glimpse of a bobcat crossing in front of me. I pulled out a snack and waited to see if I would get another peek, but after its tail disappeared in the undergrowth it never appeared again. By afternoon I was heading back into the land of rolling hills. I stopped to check my map and a jogger came running down the trail. He too stopped to check his map. He was the first person I had seen on trail all day and I was suddenly embarrassed realizing that I had just been muttering to myself about the lack of a clear trail markings. He asked me which direction I thought was which and then about my ultralight backpack. He diverted his route to accompany me up a series of exposed hills. We were walking at a good clip, him because he was supposed to have been on a run and me because I was supposed to do 35 miles before bed. We spoke of hiking and gear as well as trail running, a sport I don’t see myself getting into, and also of life off trails. I was happy to have the company, but by the time we reached his trail junction I was soaked in sweat. I did not slow down my pace, but did regret my choice to wear leggings. Here I was, in middle of winter, and it was over 80 degrees! I looked up hoping to find some sign of respite in the sky, but despite it having been forecasted as a cloudy day the sky was bright blue in every direction. I checked my maps. Though there had not been a trail sign in miles and there had been some confusing cattle gates it looked as if I was going the right way and it also looked as if it would be a long time before I would get to any trees. I told the sun it was annoying and the hills that I didn’t like them and kept going managing to sneak little pauses in whatever shadows I ran across. Beyond one more hill I could see the tree line. I reached it and the trail frustratingly jogged away from the trees. I hiked faster. It had to go into the trees eventually. A few more turns and hills later and the trail dipped into the woods. I smiled at the beauty before me. The trees cast a web of shadows, and I was finally cooling down. As the trail cut through the woods, I stood right beside the trees looking up at their impressive stature. I rediscovered my love for the woods. After hiking the Pacific Crest Trail, I thought I was “over the woods” preferring sweeping vistas, and exposed ridgelines. In this moment I still loved those things, but was completely surprised by the beauty of this flat wooded stretch of trail. The day was mostly gone and I still had 9 miles left to hike to reach my goal of 35 miles. I had to hike 35 miles to ensure that I would be able to finish with enough time to shower and get to work in time the following day. I kept walking. I walked quickly, still noticing the little creatures and the “old man’s beard” hanging from trees, but I tried my best not to stop. Exiting the trees around Mount Tamalpais, I was met with a view of the sun sinking into the ocean. I wanted to stop and watch. I wanted to keep going to finish my day. I kept walking. I lost sight of the sun and felt like an idiot and began to run. I ran until I could see the sun again and then continued to walk, relishing the fact that each time I looked I was seeing the sunset from a different angle and with a different foreground. The colors disappeared and the sky grew dark, it would be a while yet until the moon would rise. I pulled out my headlamp to maintain my hiking speed. I was going to have to problem-solve if I wanted to finish my hike. I was tired. I decided to cut my day short and sleep in Pantoll campground making it a 29 mile day and then wake up at 2:30am when the moon was out to complete my hike. I reached Pantoll and started soaking some cold Ramen. On this hike, I wanted to experiment with going without a stove. It was what most people would describe a miserable feast, but I was hungry and tired so it did not really matter. I sat in my sleeping bag and ate some cold partially soft and partially crunchy ramen with far too much flavoring. I followed this with a Milkyway bar and promptly fell asleep. At some point I woke up and barely opened my eyes only to see someone juggling flaming sticks in the campsite next to me. I was confused, but despite the oddity sleep tugged my eyelids closed my eyes and the next thing I knew my alarm was ringing. Are you Scared of Coyotes? Mountain lions make me quite nervous. It’s the type of thing where most of the time I don’t think about them, but sometimes I get started thinking about them and I just can’t stop. This particular morning, at 2:30am, was one of those mornings, but if you had asked me if I was scared of coyotes that morning I would have confidently said no. Coyotes are usually skittish and do not have the same somewhat unpredictable behavior that mountain lions do. I was enjoying the cool morning and the full moon lighting the trail, when I saw eyes reflecting the light. I jumped and started making noise immediately. It was only a deer. I kept my headlamp on after that, somehow convinced that the small beam would make me safer. I spent the morning hiking in this rather jumpy state when all of a sudden I heard coyotes, a lot of coyotes. I had heard coyotes many times before and I always thought they sounded kind of funny, a bit like young teenage girls having a party with yells and sharp giggles. Right then, I did not find it funny. I suddenly felt scared of coyotes. It was dark and there was a whole pack of them yipping and pathetically howling and I had to walk right past the noise. I couldn’t see them even with a scan of my headlamp so I assumed they were a ways below me on the hillside. I committed to power-walking past, feeling my heart race in anxiety. an owl flew over my head and the clouds began to blush pink. I looked at my watch figuring out how long it would be until there was enough light to see. I switched off my headlamp and enjoyed the sunrise through the gaps in the hills. I heard a scratching noise, exactly like the noise my dog makes when she scratches her ear. I turned my head. Opposite the sunrise was the moon was setting and beneath it about 5 feet from me was a coyote doing a morning scratch and stretch. With the sunlight, I regained my confidence. I was not scared. I just watched as it did a perfect downward dog stretch and then headed into the brush. I had cell phone service and received a text from my father asking if I was going to make it or if I would need a ride. I sent him a photo of the coyote and then looked at my watch. It was going to be close, but I might be able to do. I texted him back saying I was going to try. I accidentally picked a trail variation that had more altitude gain and cursed as I hiked up to hawk hill, prematurely blaming myself for my potential failure. A few minutes later I saw the golden gate bridge. I smiled and started singing. I felt tears slide down my face. I wiped them and laughed at myself, not quite sure why I was crying. I started singing again and I felt so happy that I am sure my walk looked more like a skip. I felt tears again. The random song that had popped into my head was one from childhood, Unwritten by Natasha Benningfield, “Reaching for something in the distance/ So close you can almost taste it/ Release your inhibitions/ Feel the rain on your skin/ No one else can feel it for you/ Only you can let it in/ No one else, no one else/ Can speak the words on your lips/ Drench yourself in words unspoken/ Live your life with arms wide open/ Today is where your book begins/ The rest is still unwritten.” I laughed at myself again, but this time did not dry my tears. I let myself walk laughing and smiling and crying and singing. As I walked across the Golden Gate Bridge, something I had only done once before despite having grown up in San Francisco, I knew I was going to make it. Coming Up: Three Easy Ways to Connect with the Trail! 1. 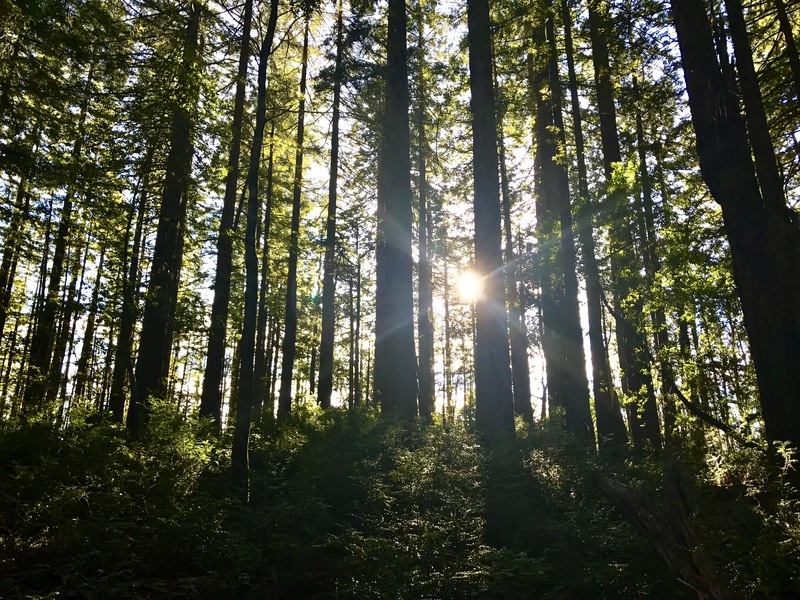 Simply enter a giveaway April 1st-30th, 2018 to help increase awareness about the Bay Area Ridge Trail and support trail maintenance and extension! This is especially important this year after the fires in Northern California. Prizes include: REI Co-op backpack and trekking poles, Whole Foods Market $250 gift cards, an REI Co-op camping trip, and a Bay Area Ridge Trail guided hike. This giveaway is in partnership with Whole Foods Market, REI Co-op and the Bay Area Ridge Trail. 2. Shop at Whole Foods Markets in Northern California on April 19th 2018 and 5% of Sales will be donated to the Bay Area Ridge Trail! Find a participating store near you. 3. Celebrate Earth Month and join us for a hike on the Bay Area Ridge Trail! Find a time and trail section that work for you. Check out these links to register and for more information. 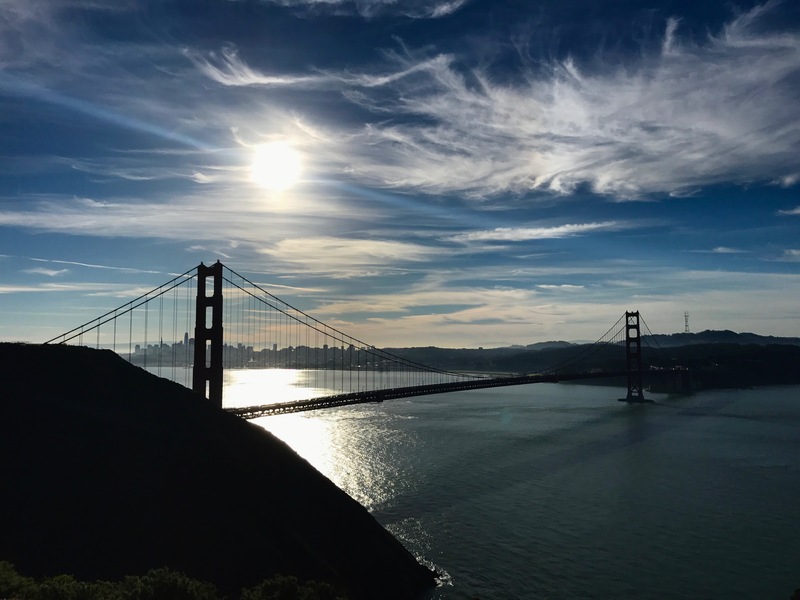 Looking for a different hike on the Bay Area Ridge Trail or these times don’t work? Feel free to contact me for trip planning advice, to ask questions about the trail or to arrange a guided hike! Four years ago, I woke up in an Appalachian Trail Shelter on the last day of a 5-day backpacking trip I was leading with Tufts Wilderness Orientation. I squirmed to a sitting position in my sleeping bag and looked out of the open side of the shelter. Of course, I sighed, the birds were chirping and the sky was blue and I just was not ready to go back yet. But back we must go because the incoming freshmen we were leading were due for their welcoming orientation. I rolled over to face my co-leader and one of us voiced what we were thinking, What if we just didn’t go back? What if we just did this? And that was the beginning of my thru-hiking dreams. I kept playing with the day dream and then this year I realized, wait a minute… I could totally do this. So here I am, I am 24 and about to attempt a thru-hike to the Pacific Crest Trail! This trail goes from Mexico to Canada, entering six different North American ecozones and passing through the whole length of my home state of California. I graduated from Tufts University in 2015 with a Bachelor of Science in Biology and Child Development and a Dance minor. The following year I worked in New England as an environmental educator and outdoor educator with Christodora and this year in San Francisco I work as an education specialist for Save Nature teaching conservation science and as a sales specialist at REI. And now I am heading off, to immerse myself in the world of nature and biology, a world I have loved since childhood and a world fear is too often forgotten. I am heading off to do a very simple thing–I am off heading off to walk. What a great story! I love the mix of urban, everyday and wildness. Well done on meeting your deadline, too.